Metro earns more than $100,000 from the contractor that provides Transit TV each year, helping to subsidize customer-paid fares that cover only 28 percent of the cost of the ride. While this is not a lot of money in terms of the cost of running a huge transit agency like Metro, it’s enough to make it worthwhile and there is no cost to Metro for providing Transit TV. How do the monitors aboard Metro’s bus fleet receive the programs that change daily? By a specialized digital system created to collect the news, weather and feature programming and transmit it to the buses via Wi-Fi. Each day Transit TV runs dozens of short programs of national, world and local interest on a variety of topics including news, health and fitness, safety, L.A. history and self-help. For example, a segment called Transit TV Teacher offers short lessons on common mistakes such as the difference between the words “there” and “their.” How-to tips might explain how to prepare a resume. A Hulu-produced show called The Morning After offers synopses of the previous night’s TV programming. Daily news segments come from AP news and Telemundo. There are a variety of trivia games for riders to play, with answers sent in via email. Recently Transit TV began running clips from Metro Motion, Metro’s TV news show that features a variety of entertaining and informative transportation news and feature stories throughout Los Angeles County. Most stories change daily, although contests change weekly and there are several transmissions throughout the day. How does this happen? Segments from the wide variety of sources are posted to the Tezo Systems (for Transit TV) ftp site. Tezo itself produces local content that is moved to the publishing queue. The content is assembled into a 1-hour loop that contains several dozen pieces including commercials that, as on TV, pay for the shows. The pieces are recoded to make them compatible with Transit TV specs. This allows them to play on the monitors on the buses. The encoded loop is then transmitted over the internet to a server in downtown Los Angeles. From there the 60-minute loop of shows is sent over the cellular network to station servers at each Metro division. From the station servers content is transmitted via Wi-Fi to onboard computers (called media engines) on the buses. When the buses come within 600 feet of the station servers they automatically communicate. If there is new content, the buses collect it. Throughout the day the media engines are constantly looking for this communication. Typically the buses return to the division yards at some point during the day and pick up any refreshed material. New content is typically available in the morning between 8 and 9 a.m., with additional news available in the afternoon between 5 and 6 p.m. In addition to the shows, games and news, GPS-triggered advertising banners promoting businesses that the buses are passing by pop up as the buses are passing. See an ad for ice cream? You just might be able to hop off the bus and buy some. 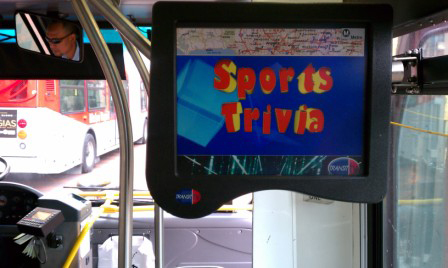 Transit TV debuted on Metro’s 2,000 buses in 2006. Video presentations aboard transit systems have the potential to enhance the passenger experience, to draw and retain customers, and to add value. Instead, Transit TV seems to be driving them away. So, perhaps, Metro could look for another contractor or could establish its own service since Transit TV is just so poorly-designed and -executed. I would love having something interesting, entertaining, and professional aboard the subways, for instance, since the views are so limited in the tunnels. Also, waiting for vehicles at the stations is the point in the passenger experience when people are most bored and most dissatisfied; station waits are continually cited as the worst part of travel by mass transit and are, therefore, the places where well-produced entertainments that support the Metro brand can be welcome. Why do they have to be so loud? IMO, these things would be so much better if they are muted and run with subtitles or closed caption instead. Um, no. Not everyone has an unlimited ride monthly pass nor has the need to get one either if they don’t ride Metro often. Many people ride the bus with cash or with cash value topped off in their TAP cards. The moment I get off the bus, I have to shell out another $1.50 to get back on the bus. It’s not worth it for non-unlimited ride riders to waste a $1.50 that they just paid only to get off the bus five blocks later to buy ice cream they saw on the ad on Transit TV and get back on again by paying another $1.50. Yeah, I’m sorry to say I, too, find TransitTV so annoying. I appreciate anything that helps generate revenue for the system, but every time I’ve been on a bus with this, the monitors are totally scratched and tagged, the volume is either off or uncomfortably loud, and it really doesn’t look like anyone is listening or paying attention to what’s on. I agree with the first commenter. Having these monitors at major stops (schedule time points) to give real-time updates in a crawl would provide content that people are more likely to actually look watch. Just because Metro doesn’t measure the cost to passengers of creating a noisy transit environment that is not conducive to relaxing or work does not mean there is “no cost”. Transit TV is a constant reminder of the way Metro treats its “customers” as a captive audience that should be packaged and sold to advertisers, all for a measly $100,000/year. I’m sure that some people like Transit TV. There are benefits and some useful information and interesting segments. But to pretend that there is no cost involved to passenger comfort and experience speaks volumes, pardon the pun. I have to agree with Matt and say that these would definitely be more welcome on the Red and Purple lines as opposed to the buses. Is this per bus or the entire system as a whole? And if Metro really thinks that there’s no cost for providing Transit TV, there’s the initial installation cost, servicing and maintenance fees to keep those TransitTV in working order. If Metro is only getting back $100,000/year, Metro really needs a lesson in principles of marketing and basic accounting management. It’s these type of financial mismanagement that drags Metro down the financial debt hole. IMO, Metro could be easily make ten times that by opening up stations for businesses via rental income and profit sharing. I have found TransitTV useful at times. There has been some comment that I have pursued beyond the buses. However, as an earlier poster commented, I frequently find on 51xx buses the system is off or muted, and monitors etched. It would be great if there were captions for the content. I do have one axe to grind. During public review periods, there should be information posted about the bus lines that are being proposed for alteration or cancellation. I don’t believe that you’re doing all that you could do to inform the riding public about service changes. I find it very upsetting that we’ve been put through the torture chamber that is Transit TV for only $100k a year. That’s pathetically little money for making the bus rides unbearable. I thought Metro was racking in million of dollars for this and was willing to put up with it if it mean keeping the fares low. But clearly, for such small sum that Metro is collecting, it is really an insult to transit riders. If a bus line like the Line 260 in which the buses only go back to the yards for gas, does it mean that buses on these lines may or may not refresh their contents as often as they should.? I have to chime in with how horrible Transit TV is for me. Terrible content that is so loud I can barely think. Why Metro couldn’t work with Transit TV to find something that doesn’t impose on passengers so much is beyond me. . .
Also Steve and Kim, I really hope you are taking this feedback back to the brass at Metro! $100,000 divided by 357,258,676 FY2011 Bus Riders = $0.00028 cost per rider. When you think of the number of ads someone sees while on a bus, the cost per 30-sec impression is even lower. It sure is cheap to blare advertisements at bus commuters who try to catch some sleep after working two jobs. Only when the hellish scourge of TransitTV is being piped into the cafeteria, the lobby, and the executive reception and bathrooms at One Gateway shall my hate and contempt for that vile service end.